Flexible Rate: The reservation may be canceled free of charge 7 days prior to arrival. In case of a cancellation within 7 days or no-show there will be no refund. Advanced Purchase: The full amount is charged at time of booking. In case of cancellation or no-show ther will be no refund. Please note this property hasno reception, therefore, it is compulsory to arrange a time to collect the keys to your apartment. We kindly askyou to contact us at least 24 hours prior to the check-in date. The apartment is available no earlier than 15:00 and once yourarrival time is confirmed we will schedule for a member of staff to personallymeet you at the location to check you in. The keys will only be given to the booker following verification ofphoto identification and after full paymentfor the accommodation and damage deposit has been received. 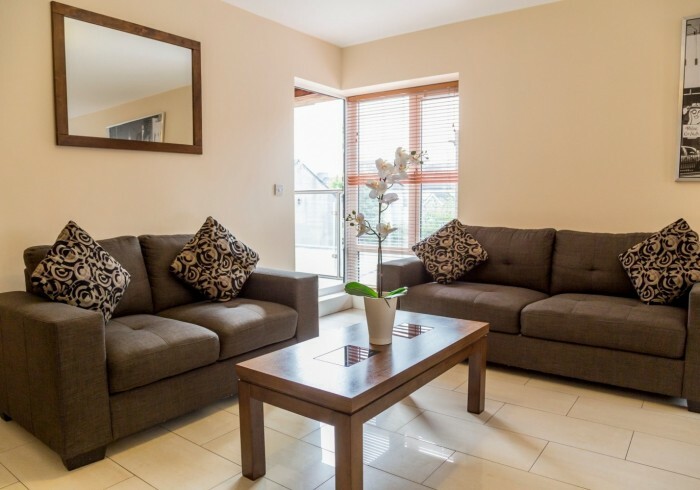 Located in the vibrant south city centre, offering luxury accommodation options (1, 2 and 3-bedroom units), Pearse Street Suites are the perfect city centre base for all kinds of traveller. All suites are furnished to a high quality standard, providing all the home-from-home comforts you will need. Each suite has a well-equipped kitchen with fridge, freezer, washing machine, dryer, cooker, oven and microwave. All utensils including crockery, cutlery, pots and pans, hairdryer, iron and ironing board are provided. Pearse Street Suites feature a spacious open-plan kitchen/dining and living room, a generous bed-room with king-size bed and a luxury bathroom. The lounge area contains a comfortable couch and armchair, coffee table, sideboard and 32″ LCD television with 60 cable channels High speed wired and wireless internet is provided free of charge in all apartments. All bedrooms have quality king or twin beds, large wardrobe and chest of drawers/dressing table. Spacious bathrooms all contain power showers. Bed linen and towels are provided and are changed weekly/daily (extra charge for daily service). There is a large rooftop patio for communal use, which offers some of the best (and free!) panoramic views of the Dublin city skyline. On-street paid parking is available in the surrounding area; however, given the central location of Pearse Street Suites, a car is not required. Wheelchair accessible – lift to all floors. Secure bike storage offered. Pearse Street Suites are located in the heart of Dublin city centre, beside the Bord Gais Energy Theatre / Grand Canal Square and within a short walk to Grafton Street, St. Stephen’s Green, IFSC and the 3 Arena, which makes them ideal for your business or leisure needs. The Aviva Stadium and the villages of Sandymount and Ballsbridge are also within walking distance. Address 1: 130 Pearse St.